She has dedicated her life so far to making a positive difference in the lives of others within her community, and now Nicole Basso has been honoured by her community for her efforts. Nicole, who will go into Grade 12 this fall at Dr. G.W. Williams Secondary School, was honoured with the Youth Volunteer Achievement Award at the 2018 Community Recognition Awards. She was singled out for her efforts in raising both funds and awareness for a number of community organizations, as well as for facilitating inclusivity within and beyond Williams’ walls ranging from the LGBTQ2+ community to Syrian refugees. Each year, the Youth Volunteer Achievement Award is presented to a young citizen who has made a significant contribution to their community through positive leadership. “Nicole has brought a meaningful voice to the Youth Engagement Community and has helped better our community through her involvement,” said Mr. North. “She is also a volunteer with the Aurora Public Library and has taken on leadership roles on both her school’s Equity Committee and Student Councils. Through her work on the Dr. G.W. Williams Equity Council, Nicole helped organize and facilitate a number of events for the community including mental health week, Rainbow week, and bullying prevention. 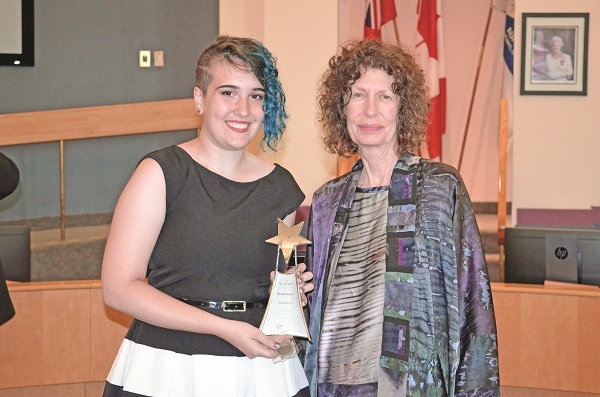 Receiving her award from Councillor Wendy Gaertner, Nicole kept her reasons for volunteering simple.